Long time readers know finding a prosecutor is almost impossible. Public corruption prosecutions must be demanded by many people before equal justice under the law actually exists. Then there is McGrath Law Office in Mackinaw. These guys represent many small units of government who evidently aren’t capable of reading the Open Meetings Act and Freedom of Information Laws themselves. They hire this firm to be at meetings and handle FOIA requests. McGrath is well paid, but are they doing their job? Not according to the Attorney General! Two Requests for Reviews were filed, one against the Village of Stanford and one against the Allin Township Fire Protection District. The first thing the AG does after accepting a Request, is ask for a response from the accused. Both reviews pertain to FOIA requests where information was redacted. Do lawyers know the law? Did they not respond because they think the AG will just go away quietly? 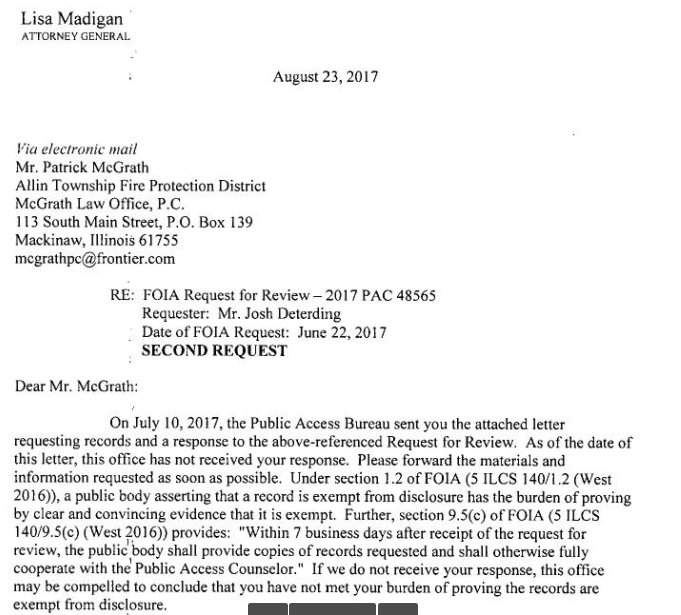 Madigan’s office doesn’t like being ignored. Maybe Allin Township Fire and the Village of Stanford need new legal counsel. 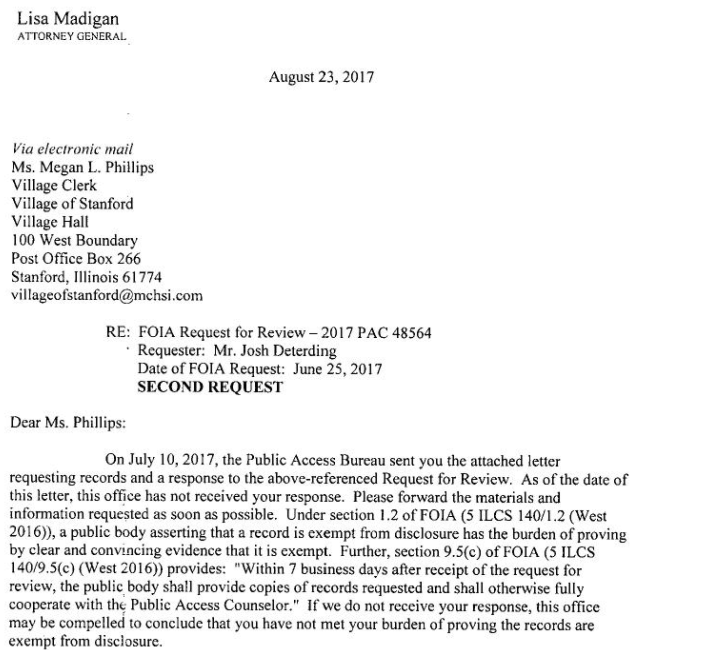 Maybe Allin Township Fire and the Village of Stanford should read the law and handle FOIA requests themselves, the documents belong to the people – not them. Posted in BloNo, Local, Progressives.Tagged Allin Township Fire Protection District, Attorney General, McGrath Law Office, Public Access, Village of Stanford. Next Post ISU: Allow HATE speech on campus?